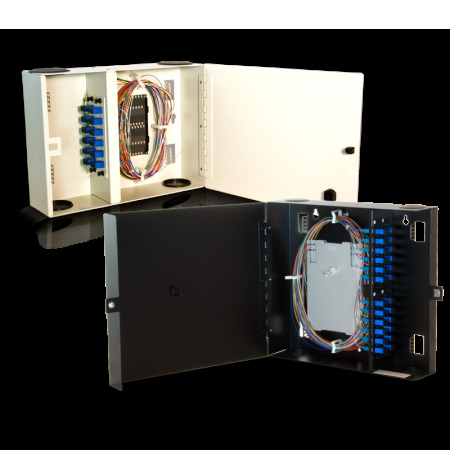 Provide termination only or splice and termination options. Applications available from 6 fibers to 144 fibers. Cable options include singlemode or multimode, riser or plenum and inside or outside plant. Ribbon fiber applications are available. Units mount into 11.5" x 8.5" to 17" x 32" of wall space. Connector options include ST, SC, LC, FC, SC/APC, FC/APC and LC/APC. Customer specific applications on request. Components in stock to insure rapid turn around time. Built to industry standards in our ISO9001:2008 certified facility.